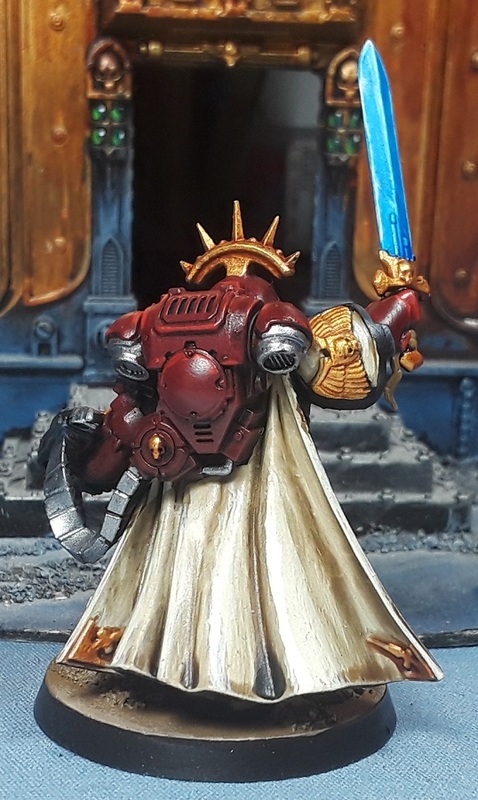 Rather than spam the blog with every single step I figured I'd push ahead and post up the (more or less) completed models, and keep the recipe pics for my own reference. So without further ado, a whole mess o' character pics! First up is the commander in Gravis armour - I really dig this sculpt, he's heavy and brutal, and the wrist-mounted bolter with the ammo feed is a nice design touch. 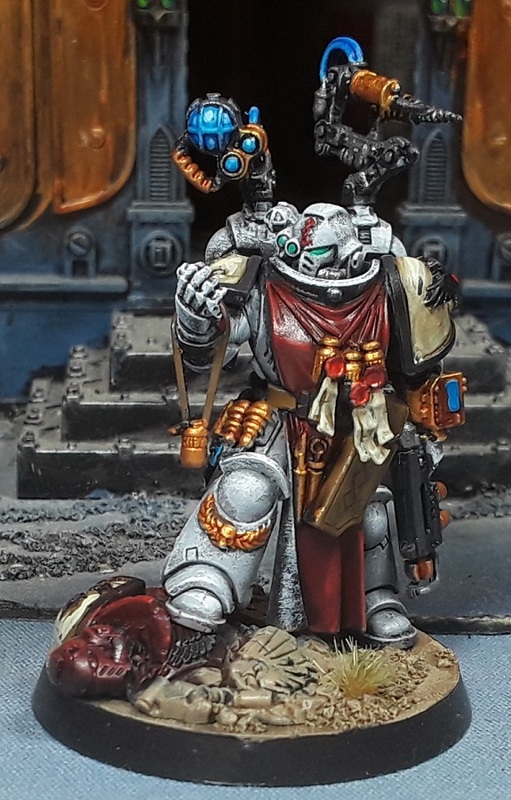 Really dig the Primaris Chaplain sculpt as well, another brutalist re-imagining of an iconic model. I particularly like the Iron Halo! 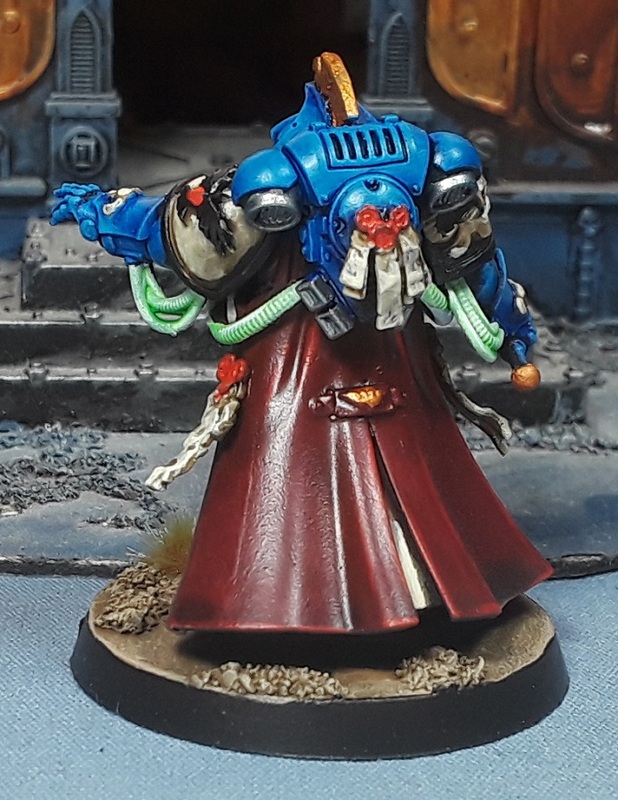 The Librarian I'm of two minds about - I enjoyed painting it, but felt that it's the least epic of the new character models. Nothing particularly remarkable in the design, though it is solid and reads as a Librarian straight away. Went back to the well with the ethereal green weapons and cabling, which sets off nicely against the blue and red. 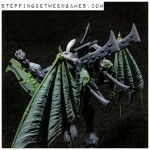 Ah the new Apothecary - I absolutely LOVE this new sculpt and think it may be one of the best Apothecaries they've done. 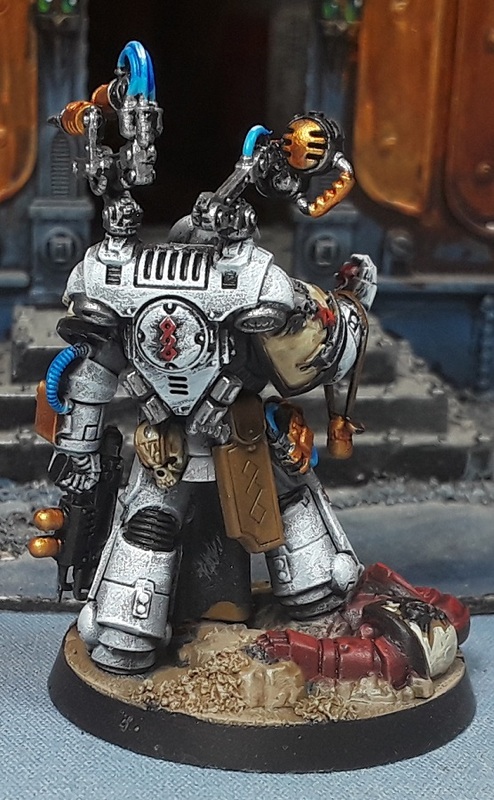 Really enjoyed painting him up although from what I understand they lost a little utility on the 8th edition battlefields. 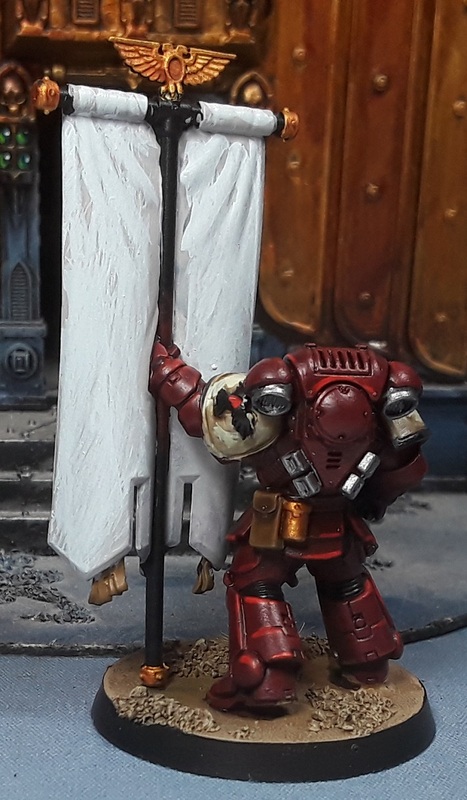 The Ancient is a fairly unremarkable sculpt comparatively speaking, but as I've always been a big fan of banners on the 40k battlefields, I really did enjoy building and painting him. Picked up a sheet of totally-not-blood-raven-transfers (wink!) 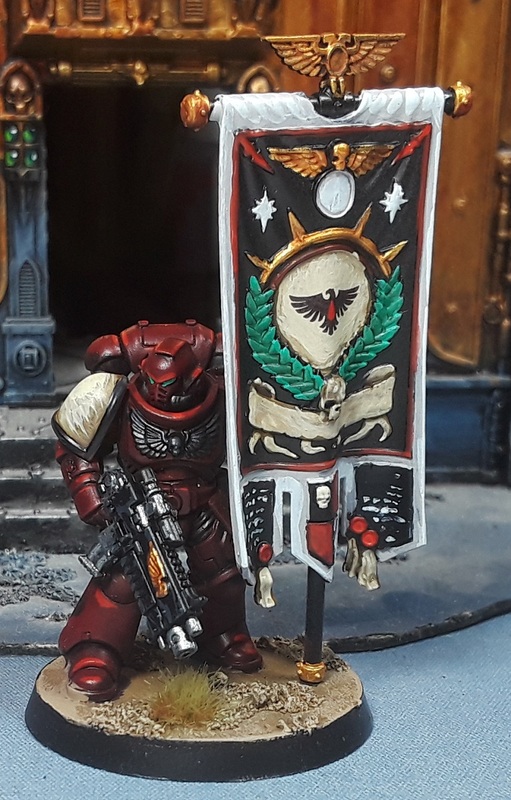 from Fallout Hobbies at NOVA and was well pleased with how it turned out! Finally, the four Lieutenant models - Fairly basic marine sergeant type figs, but pretty happy with how they turned out. 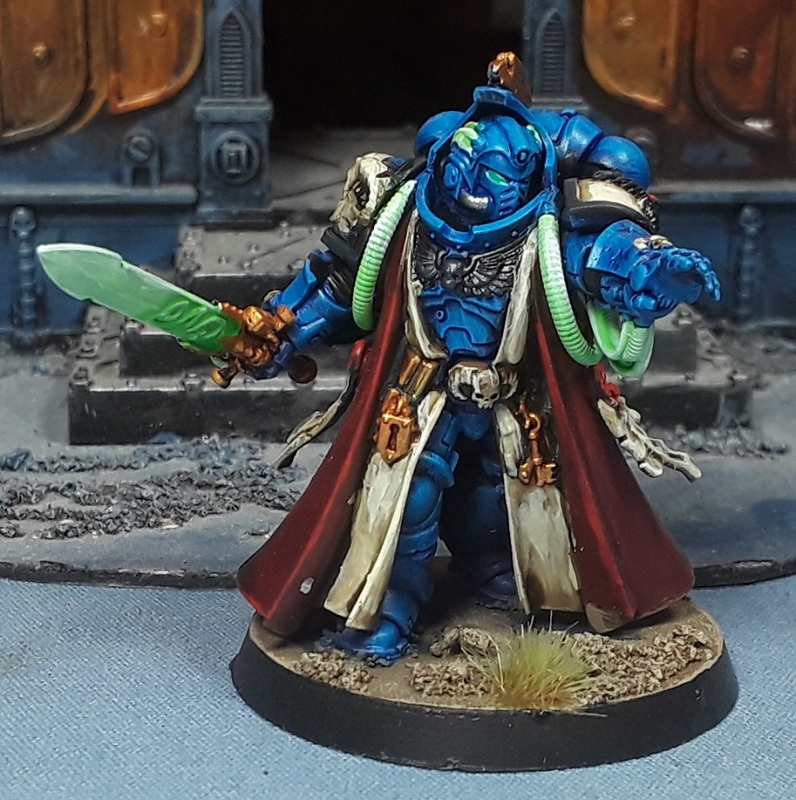 Had to use my usual bright blue color scheme somewhere in the projects after all, and the power swords fit the bill nicely! Now for the downsides - Overall I'd say when the dust settled I'm only about 75% pleased with how they turned out. It was a bit of a speed painting exercise after a long stretch of no real hobby activity, and they feel a little rough. I know that I can do better than this, and looking back over them there are some pretty jaggy blending and shading issues here and there. 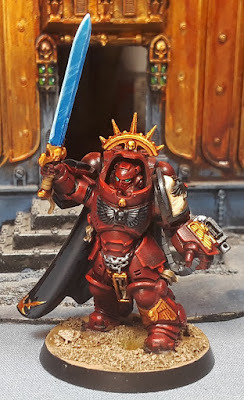 Part of that I think comes from painting-red-fatigue and in retrospect I think I may have been better served choosing some other chapter than the Blood Ravens. I'm committed now however, so we'll press on regardless. That said, I just got a shipping notification for the next batch of Sons of Horus bits, so sometime in the next week or so I should be getting a nice big box o' joy from Forge World, which includes enough bits and kits to actually get started on the next Heresy force. I'm really looking forward to getting cracking on with the sea-foam green scheme, and will be taking some lessons learned from this current project to heart when it comes time to bring brush to model on the SoH! I like them mate, not at all tardy. Nice tone of magpie red and the Apothecary does look great. 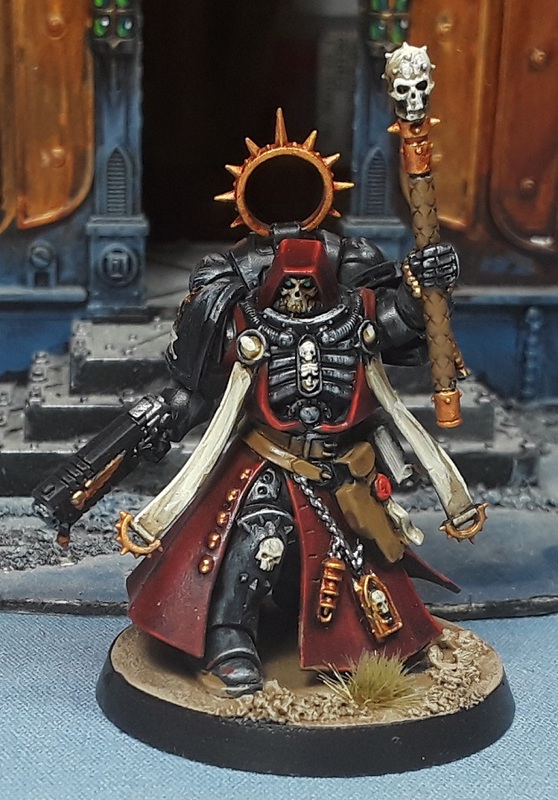 I think my favourite is the Chaplain sculpt. Those look great! Nice job. They look great. Interested in what you had to say about the sculpts as well. I'm going to buy an Apothecary. Right now. But seriously they look great. Being a bit hard on yerself mate - those marines look great from here for sure. That ghosty green on the Librarians pipes and blade is so good. I do think of all those models the chaplin is my favourite sculpt for sure. Everything looks nicely painted as well. @Siph_Horridus: Thanks man! 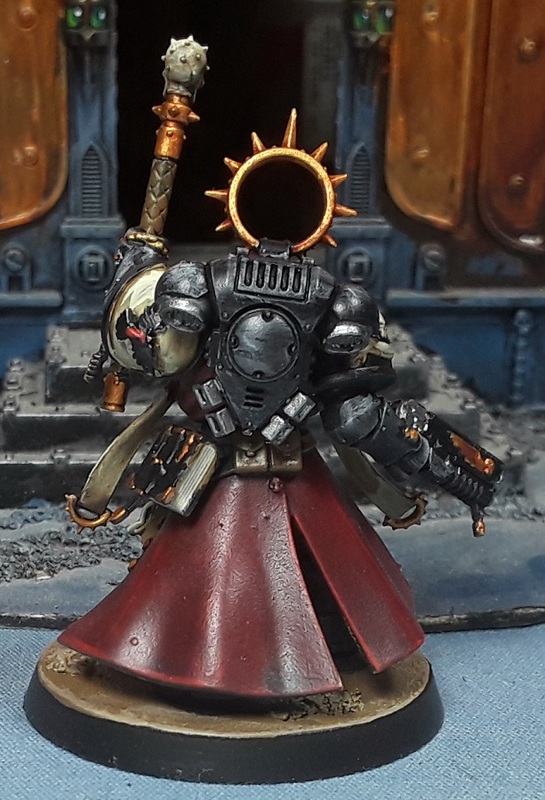 Aye the Chaplain is a sweet new sculpt. Really dig him! @Billy Pistole: Thanks very much! @Zzzzzz: I appreciate it! Aye, still reachable at moonlight@cold-moon.com or joel_moon@. @Monkeychucka: Hah! It is definitely my favorite of the new sculpts! @Riot: Haha! Indeed, they'll hopefully be seeing some table time soon, then likely off to their next home! @Dai: Cheers! We are always our own worst critics, aren't we? On the table the sloppiness isn't as noticable, but does prompt me to try and do better next time! @Rory Priest: Thanks very much, man! They were a hoot to build and paint! I appreciate all the kind words, everyone!